We find that gloves from REV’IT! are generally very consistent in fit from one model to the next, and we find they run a bit on the snug side as compared to most US based brands. 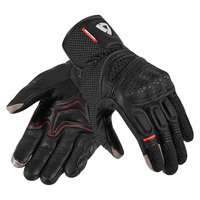 The fit is very similar to Alpinestars which also fit more snugly than other brands of gloves. The tendency to run small is not so noticeable that we’d advise you to buy one size larger, but if you are sometimes in between sizes, your best shot would be to choose larger. Hopefully you’ve had some experience with buying gloves and can choose based upon the fit of a previous pair. If you have no previous experience with glove sizing, go here for help.